It was Sunday, 1 January 1956. Like most New Year’s Days, revellers from the previous night’s festivities were nursing sore heads. With Monday being a holiday, many Ottawa residents were happy to laze about the house and enjoy their long weekend. The virtuous and hardy braved sub-zero Fahrenheit temperatures to go to church, or attend the annual Governor General’s New Year Levee. Held on Parliament Hill, more than 1,000 Ottawa residents filed into the crimson and gold Senate chamber late that morning to be greeted by Governor General Vincent Massey, before receiving a glass of punch and a light lunch in the nearby Railway Committee Room. As was customary at the time, it was a very masculine affair. Other than Charlotte Whitton, Ottawa’s formidable mayor, and some female members of the armed forces, there were very few women present. The city’s diplomatic corps was well represented, however. Among the foreign dignitaries at the reception to shake Massey’s hand were three uniformed representatives of the Soviet Embassy. Little did they realize they were about to have a very bad day. Following the levee, which ended in the early afternoon, the three Russian officers undoubtedly hurried back to the Soviet embassy for their own New Year’s celebrations, hosted by Ambassador Dimitri Chuvahin. Located at 285 Charlotte Street in Sandy Hill, the embassy building had once been the mansion of the Booth family, Ottawa’s lumber barons. Requisitioned by the Canadian government in 1942 for use by the Royal Canadian Women’s Naval Services, the house was instead turned over to the Russians to house the growing Soviet legation. As guests left the Soviet reception at about 4.15pm, Miss Diane Destonis, a neighbour living in the apartment building across the street, spotted smoke drifting from a window on the third floor of the embassy building. Another neighbour, Mr W. Dore, also saw the smoke. Believing it was a kitchen fire, he tried to alert the Soviet embassy by telephone; he received no reply. The fire was caused by an electrical short circuit in the embassy’s communications room located on the upper floor of the three-storey building. Instead of immediately calling the Ottawa Fire Department for assistance, Soviet diplomats tried to put out the blaze themselves using hand extinguishers and a small fire hose installed in the building. Thirty minutes passed before the alarm was raised. Although firefighters were on the scene within ten minutes of receiving the call, flames had already engulfed the third floor. Entering by the front door of the embassy, Ottawa’s firemen, led by Chief John Foote, were stopped by embassy staff claiming diplomatic immunity. A Soviet official actually struck Chief Foote; the incident was later played down. Denied access to source of the fire, the firemen were obliged to tackle the blaze from the outside. The Soviet diplomats also impeded the firemen’s efforts by refusing to vacate the premises. Instead, they repeatedly went in and out of the embassy to retrieve filing cabinets, boxes, and files of documents. The last item to be saved from the flames was “a heavy piece of wireless equipment.” Two embassy cars, stuffed with documents, reportedly “careened” out of the embassy driveway onto Charlotte Street, running over deployed fire hoses, almost bursting them. Incensed by the lack of Soviet co-operation, Chief Foote contacted Mayor Whitton who hurried to the scene. Shortly afterwards, R. M. Macdonnell, the deputy undersecretary of External Affairs arrived, as did Paul Martin, Sr, Minister for National Health and Welfare, substituting for Lester Pearson, Minister for External Affairs who was out of town. The mayor authorized Chief Foote to exercise all necessary emergencies powers at his disposal as Fire Marshall. At 6.30pm, he declared a state of emergency, calling in extra firemen and police support. The fire was finally brought under control two hours later, but was not extinguished until close to midnight. One hundred firemen fought the blaze in biting cold weather, using equipment from four stations, including three pumper trucks and four ladder trucks. Although smoke and hot cinders filled the sky, a north-easterly breeze blew burning embers towards parkland and the Rideau River, sparing the embassy’s neighbours. More than three thousand spectators watched the night’s drama despite the cold. Hundreds of cars lined Riverside Drive. Meanwhile, streetcar service along Laurier Avenue East was blocked. Thankfully, no lives were lost in the fire. But the embassy building was a write-off. Estimated losses amounted to $250,000 (equivalent to more than $2 million today). Ambassador Chuvahin and his wife, along with two other Soviet diplomats living in the building, lost their homes and their belongings. The Soviets set up a temporary embassy a short walk away at 24 Blackburn Avenue, the office of the Soviet commercial counsellor. The public was baffled by the Soviet effort to obstruct Ottawa’s firemen. A Citizen editorial called it “an incomprehensible act,” which put its neighbours at risk. Claims of “diplomatic immunity” in such circumstances were deemed “fantastic.” Igor Gouzenko, the Soviet cypher clerk who had defected from the Soviet Embassy nine years earlier, explained that the only reason for embassy officials to impede and delay Ottawa’s firemen was to ensure that it’s most secret documents, for example, lists of names of agents in the west and instructions from Moscow, were kept secret. Mayor Whitton called upon the federal government to review its regulations governing diplomatic immunity in order to give firemen free access to buildings in the event of future fires. The government demurred, arguing that international rules governing diplomatic immunity had been finely crafted over many centuries, and that Canadian officials abroad were accorded the same privileges as foreign representatives were in Canada. When contacted, other diplomatic missions in Canada were also wary of any change to the law, though several commented that they would have allowed the firemen onto their premises had their embassies caught fire. With the old Booth mansion a write-off, a new Soviet Embassy, built in the Socialist Classical style, was constructed on the same site. With the Cold War in full swing, RCMP counter-espionage agents, assisted by British MI5 agents, apparently concealed microphones in the windows of the new building while it was under construction. Called Operation Dew Worm, Igor Gouzenko provided advice to the Canadian and British spooks on the best locations to place the bugs. It seems, however, that western spy agencies gained little by this piece of high-tech skullduggery. Two books published in the 1980s, Their Trade is Treachery (1981) by journalist H. Chapman Pincher and Spycatcher (1987) by former MI5 agent Peter Wright, claim that the Russians were tipped off to the location of the bugs, and established a secure room elsewhere in the building. Allegedly, the source of the tip-off was a senior member of the British intelligence service, possibly Sir Roger Hollis, director-general of MI5 from 1956 to 1965, whom the authors claim was a Russian mole. The British government officially denied the allegations. But Wright’s memoir gained world-wide notoriety when the British government tried to keep it from being published. The case against Hollis, now dead (as are Pincher and Wright), remains unproven. The Soviet Embassy building now houses the Embassy of the Russian Federation. As a postscript to this story, history repeated itself in January 1987. 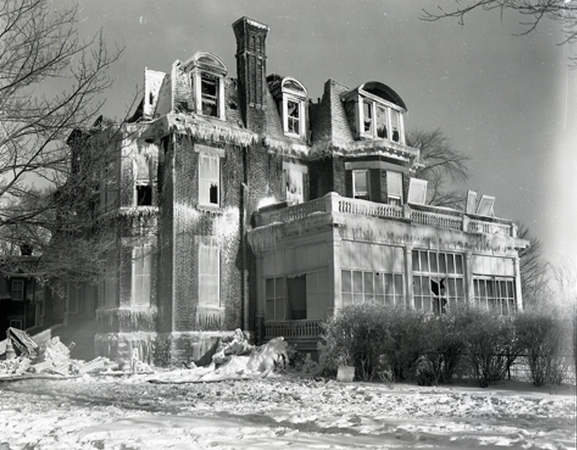 When a small, electrical fire broke out in the basement of the Soviet consulate on Avenue de Musée in Montreal, Soviet diplomats choose to fight the blaze themselves using garden hoses and snow. When neighbours called in the alarm to the fire department, Soviet officials delayed the firefighters’ entry into the building for fifteen minutes to protect documents. As a consequence, what had been a minor fire became a major five-alarm fire. City of Ottawa, 2014. “Soviet embassy fire,” http://ottawa.ca/en/residents/arts-culture-and-community/museums-and-heritage/witness-change-visions-andrews-newton-33. Gouzenko, Igor, 1956. “Secret Work of Russian Embassy Vastly Expanded Since Spy Trials,” The Ottawa Citizen, 4 January. Lewiston Daily Sun, 1956. “Soviet Ottawa Embassy Destroyed By Fire; Aides Stay To Move Documents,” 2 January. Los Angeles Times, 1987. “Soviets Keep Firemen Out, Montreal Consulate Burns,” 17 January. The Globe and Mail, 1956. 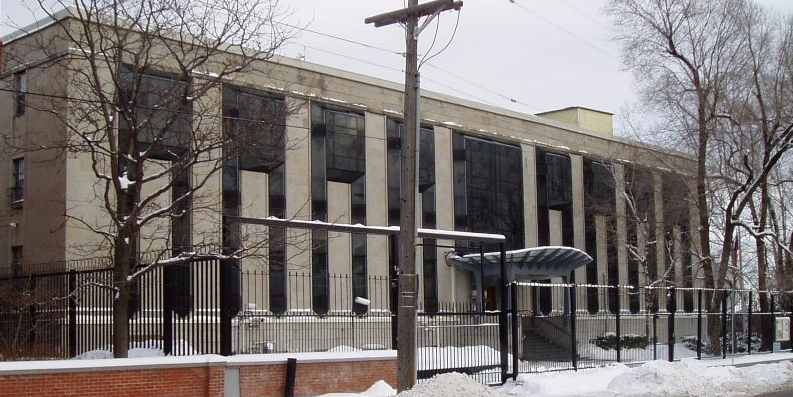 “Report Chief Struck—Embassy in Ottawa Burned As Russians Impede Firemen,” 2 January. ————————, 1956. “1000 Call on Massey at Levee,” 3 January 1956. ————————, 1981, “The Spy Scandal: Did Canada bug rebuilt Soviet Embassy?,” 27 March. Toronto Star, 1987. “Fire at Soviet embassy revives 31-year puzzle,” 18 January. The Ottawa Citizen, 1956. “Mayor Asks Way To Pry Open Embassies During Emergencies,” 3 January. ———————-, 1956. “Weary, Semi-Ill Mayor Entertains At Reception,” 3 January. ———————, 1956. “No ‘Immunity’ From Fire,” 3 January. ———————, 1956. “Flames Ruin Embassy, Red Tape Slows Fight,” 3 January. ———————, 1956. “Refused to Leave, Carried from Burning Building,” 3 January. ———————, 1956. “Senator Feared For Safety of Next-Door Residence,” 3 January. ———————, 1956. “Ottawa’s Diplomats Decidedly Cool Toward Any Curtailment of Privilege,” 4 January. ———————, 1956. “Traditional Colorful Scenes At Governor-General’s Levee,” 3 January. Wright, Peter, 1987, Spycatcher: The Candid Autobiography of a Senior Intelligence Officer, Stoddart Publishing Co. Ltd: Toronto. Images: Soviet Embassy after the Fire, 1956, City of Ottawa, 2014. “Soviet embassy fire,” http://ottawa.ca/en/residents/arts-culture-and-community/museums-and-heritage/witness-change-visions-andrews-newton-33.